I may have an affinity for flowers and it is true that I wore a skirt yesterday, but truly, I am not a girlie girl. I don’t like ruffles. I strongly dislike tiaras. And I’m not a huge fan of pink. But hot pink/magenta mylar? Oh yeah! I can get onboard with that. So, I made these little treat bags for parties and gifts to celebrate the upcoming holiday. 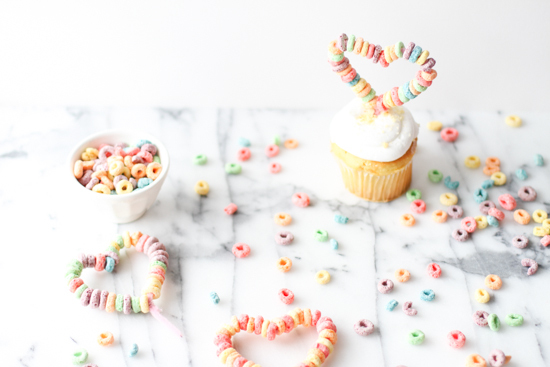 As with pretty much all of my DIYs, they’re super easy to make. And won’t take long to knock out either. Want to make you own? 1. Grab your scissors and freehand cut hearts of various sizes. I prefer hearts are a little imperfect and even a little wonky. I think they have more character. 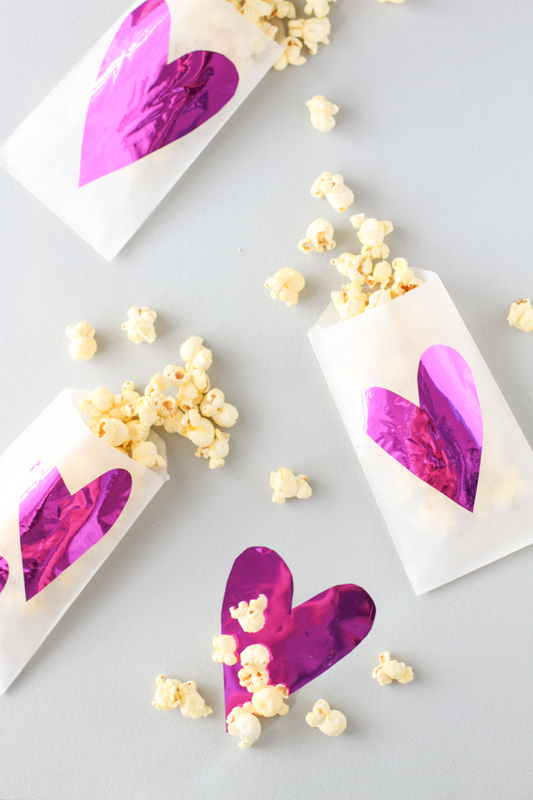 BUT if you don’t feel comfortable heading straight for the scissors, draw hearts with a pen or marker first on the opposite side of the mylar sheet. 2. 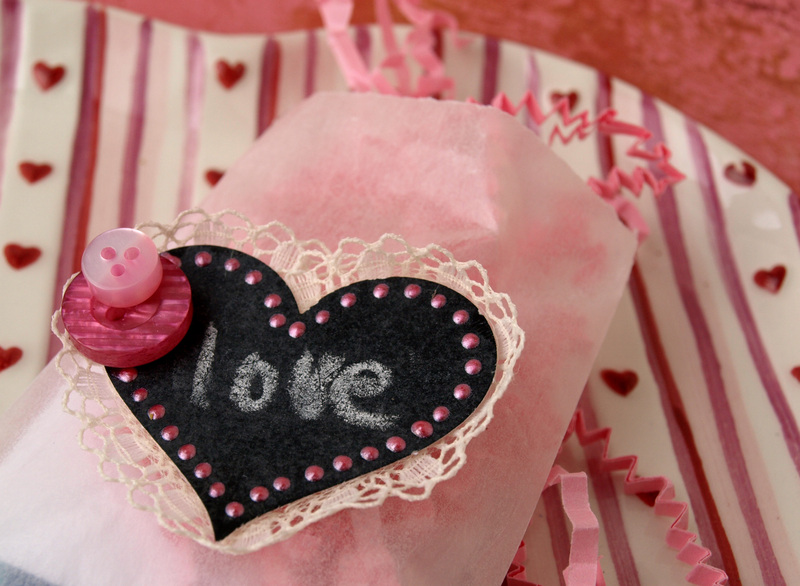 Once the hearts are cut, flip them over and cover with a thin layer of glue. 3. Attach to glassine bags and let dry. Add your favorite treat (donuts, popcorn, candy, etc) and enjoy. Does it get any easier? I love the simplicity of this project because you can do it last minute. 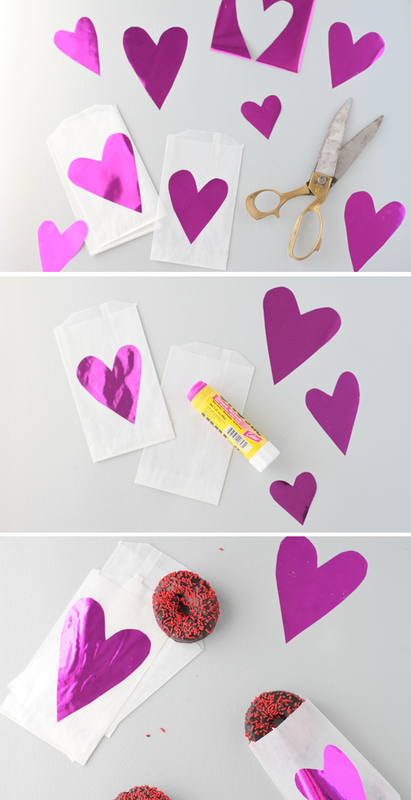 If you have kids, these are perfect little goodie bags to bring in as Valentines for your child’s classroom. 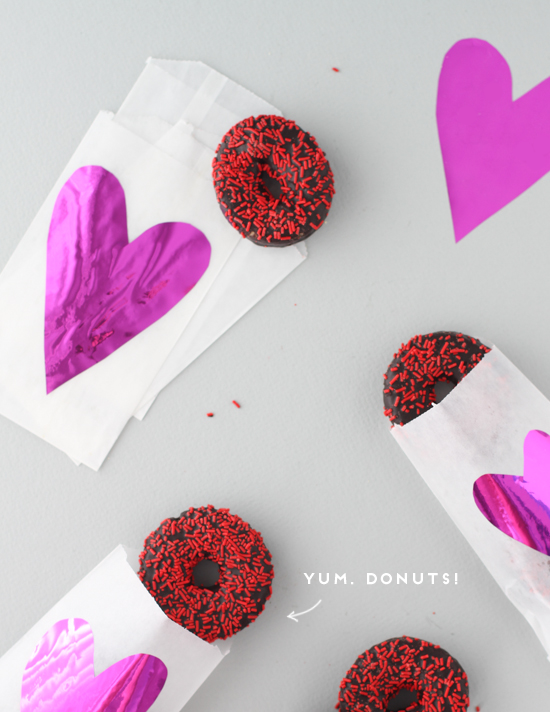 And if you’re just a kid at heart, like me, they’re great for V-Day parties or as a little treat for friends. By the way, those sprinkled donuts were insanely delicious. So if you’re looking for something to fill your goodies bags with, go to the grocery store and pick up Entenmann’s party cake donuts. They aren’t fancy. Or good for you. But they will get the job done. You should definitely give it a try. It’s so easy! Oh good. I’d love to see how they turn out if you end up making some of these little guys. sO CITE AND ORIGINA! pERFECT FOR A bIRTHDAY pARTY! oR vALENTINE’S DAY! Cool! Where did you get the mylar?! I love that these are so simple, yet make a huge impact! I’m also picturing red and blue mylar stars for a 4th of July party…so cute and so versatile! Shut up! I freaking love these! So cute! This is SO cute! Love the pics too! This is such a great idea for any occasion! 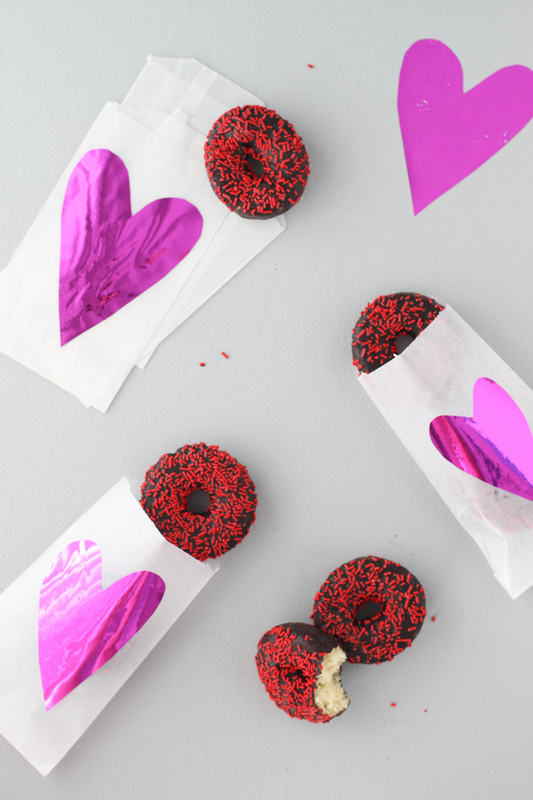 Simply find some food packaging bags and have a cool treat. I love the idea! So sweet! 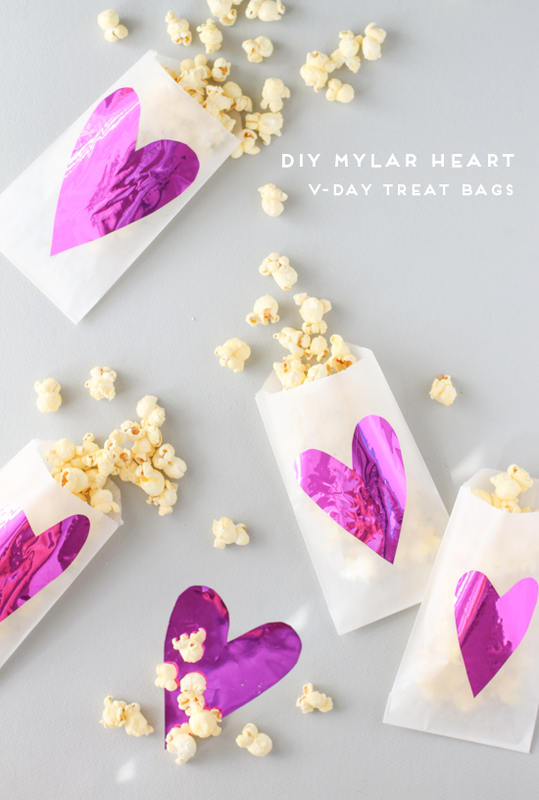 One source of mylar is the mylar balloon you received for your birthday, Valentines Day or whatever and couldn’t bring yourself to throwing it away when it finally deflated. I went ahead and used deflated mylar balloons from BD party! Some of them are colored inside too!